Why spend months of planning, weeks of preparation and packing, then 930 miles of driving, a border crossing, a ferry ride, all to skinny into a 22” wide boat and paddle 60 plus miles in a potentially dangerous ocean? Meet worried me, lecturing my more easy-going and adventurous self, as I scanned out over the San Juan Islands into whitecaps and 20 knot winds. What was I thinking?! This was my final driving break before crossing the border for a week of expedition kayaking with friends in British Columbia’s Southern Gulf Islands. 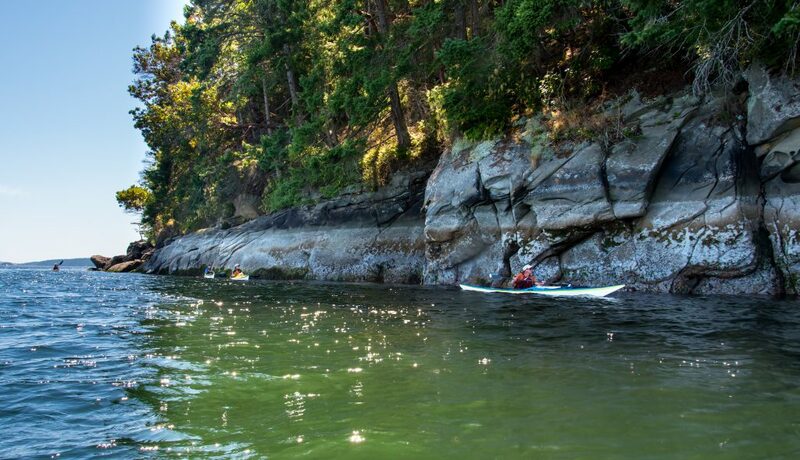 In the previous three summers we and other friends had kayaked the San Juans twice, and Broken Group Islands in 2015, so it definitely felt time to explore some of the Gulf Islands. Not quite believing all the wind, I brought up weather on my phone, and sure enough, there were even small craft warnings to match the look of things. Not exactly the idyllic, serene islands and protected waters I had pictured; it was nasty out there! A couple hours later, I met my intrepid paddling friends in Vancouver’s ferry terminal town of Tsawwassen, and somehow even just that alone melted away most of my concerns about paddling conditions. It was great to reconnect over dinner and share the anticipation of our trip. 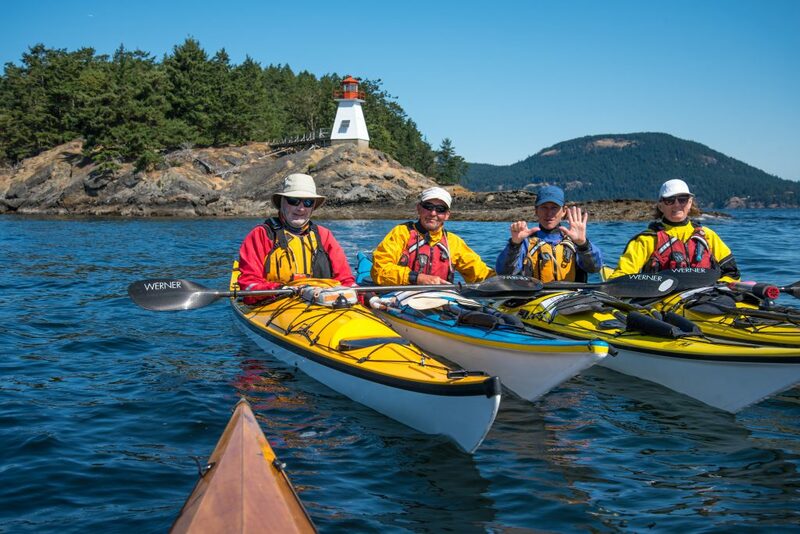 Although there are Zen filled, adventurous kayaking loners out there — and I get that — good (and experienced) friends are one of the best parts of sea kayaking, for both fun and safety. That evening, in a notably awful roadside RV campground, I took my coveted last shower for a week, then fussed over final attempts at reorganizing everything I would need (or not) for a week out in the boonies. Between that, a little more drone of the marine weather radio, and driving fatigue, I was Done. Nicely, somewhere amidst all the high wind reports, I had picked out a “wind, zero two” forecast for the one spot actually within our planned route. That’s more like it! All was good on the water, and in my head. Sweet dreams. Lucky to sleep past 5 a.m. in summer’s northern latitudes, it was not at all difficult to get to the ferry terminal by 8 a.m. I love ferry rides, and after breakfast we were all out on deck noting some of the landmarks and currents we would soon navigate ourselves — in oh so much smaller boats. 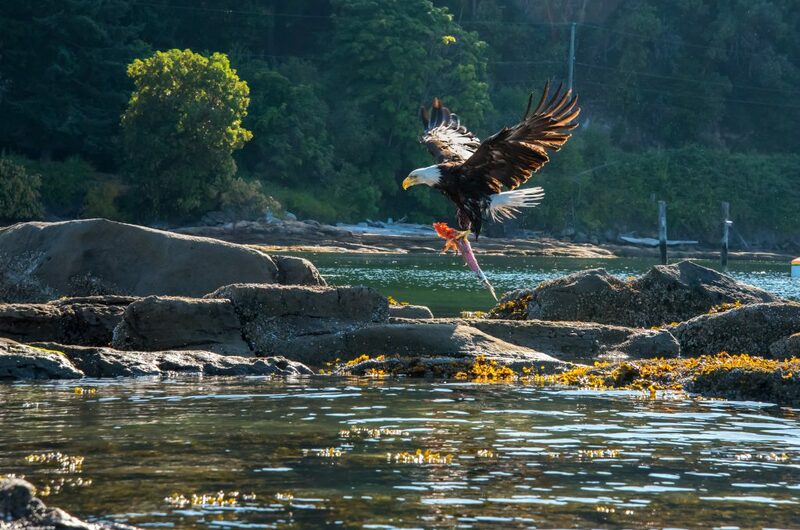 And with that, we were soon bumping our cars up and off the ferry onto Pender Island. Just two and a half hours later, we had unloaded and packed our boats, parked our cars, and launched from Medicine Beach, right on time. Yep, a great group — not our first rodeo! 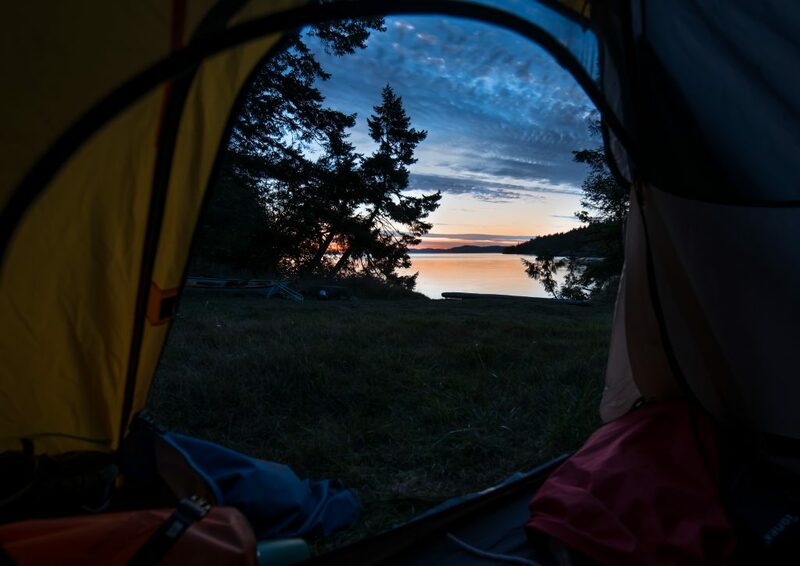 We would paddle southwest a couple miles, hook northward around Wallace Point, then hitch a mild flood tide ride up Pender’s west coast, before a 2.3 mile crossing to our first night at Ruckle Park on Salt Spring Island. It was sunny and warm while packing our boats, but a high overcast dropped in to make for a comfy and beautiful first day’s paddle. After scouting a mile of the Park’s coastline from our kayaks, we did just fine with the rocky landing areas near the Ruckle lighthouse, thanks to information on bcmarinetrails.org and some calm weather. Although Ruckle Park was a bit crowded, we actually enjoyed our semi crazy neighbors, and of course, we enjoyed views out over the sound. Not bad at all, having been in car travel mode just that same morning. An enticing feature of our whole week, was that the bulk of it was “hand-railing” the island coasts — literally paddling within a few feet of the shorelines for miles at a time — providing the continual close-up experience available only in extremely capable, quiet, self-propelled boats with a draft of just 3 inches. Furthermore, most of our paddling effort for the week was assisted by tidal flows; a 2mph horizontal escalator, courtesy of our favorite moon. 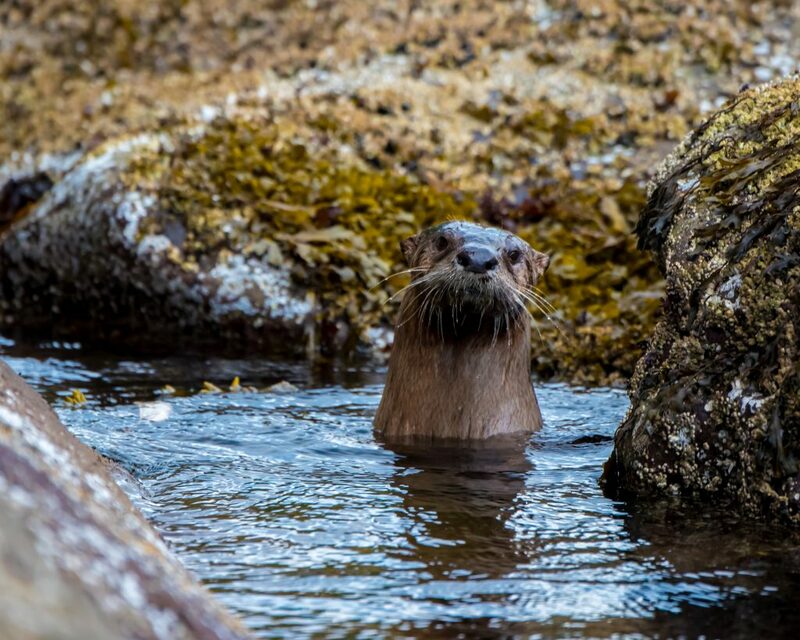 Sea kayaks rock! But we are not the first to have figured this out. 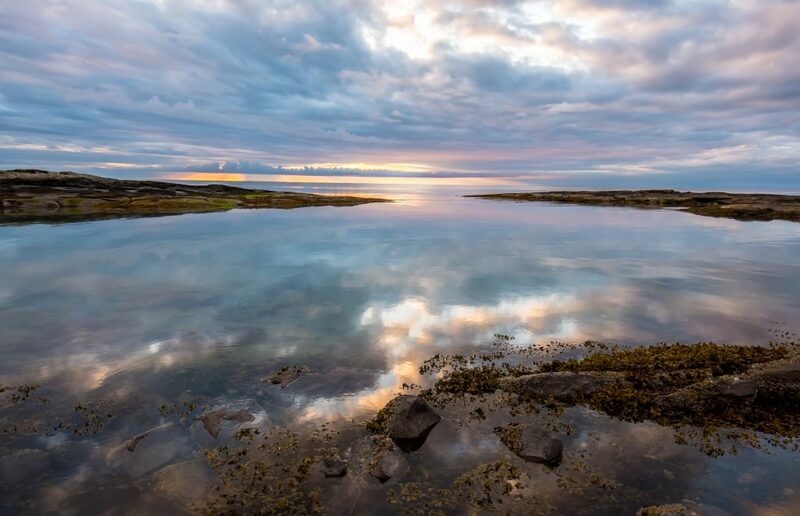 The Wsáneć First Nation peoples thrived in these islands, and in fact the entire Salish Sea region for 5000 years, until just recently when 19th century European settlers nearly snuffed them out. 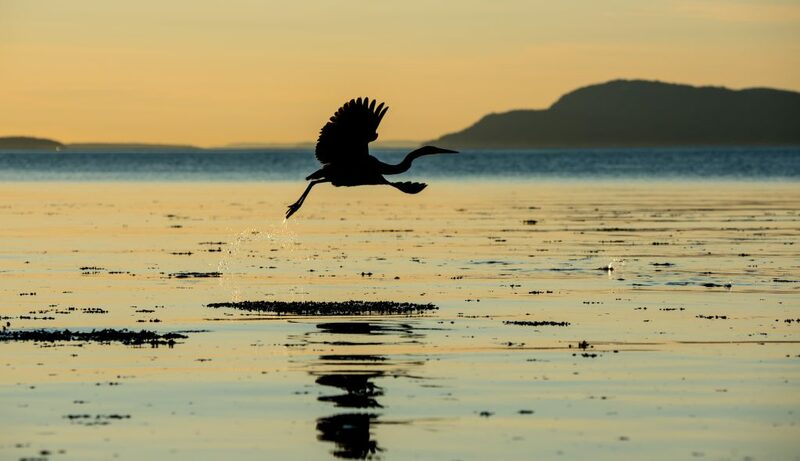 They paddled the islands in wide, multi-person cedar canoes, hunting, fishing, clamming, and trading among local family based island groups and across the sometimes daunting strait to the mainland’s Fraser River valley. In spite of all our high tech kayaking gear, I realize our trip has perhaps unwittingly tried to replicate a taste of their rich and peaceful history. One of our trip’s goals was to make Galiano Island’s northernmost Point Dionisio, overlooking the impressive tide races of Porlier Pass. 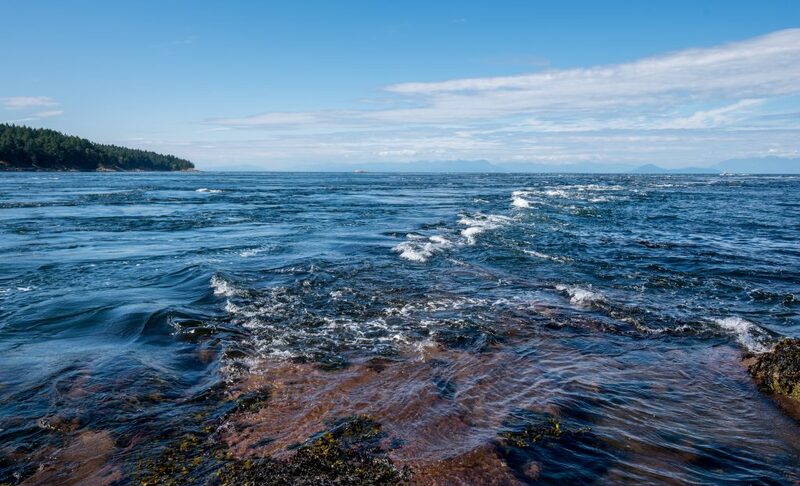 The Gulf Islands and islets are relatively long and narrow, all lined up as if they conspired some crazy notion to block the completely unimaginable amount of tidal water being pulled in and out, twice each day. But, of course, all that water absolutely finds its way, rushing through narrow passes such as Porlier. 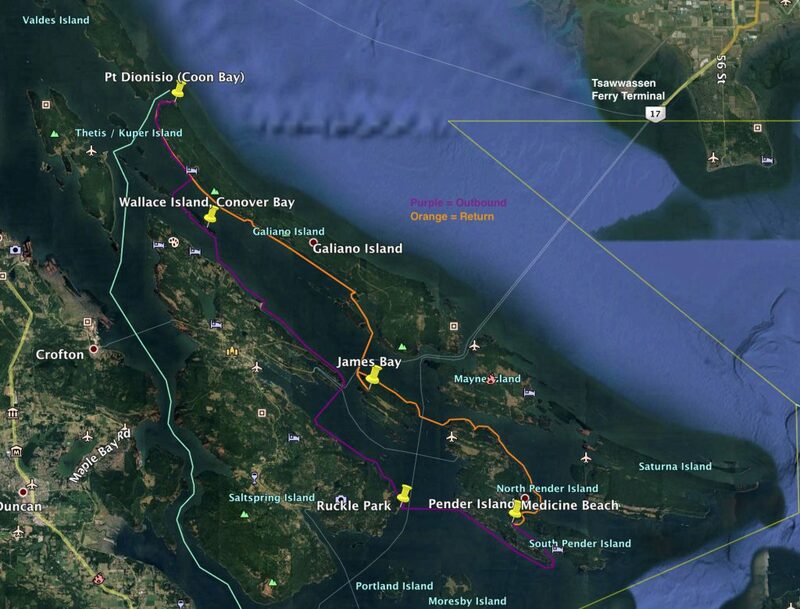 Modern forecasting allowed us to plan our departure from the previous night’s camp at Wallace Island in time to paddle through Porlier Pass at a benign but rather exact 1 p.m. slack tide. Just three and a half hours later, we would enjoy the full turbulent nastiness of a 7.9 knot flood tide race around the same point and a mile beyond …while safely perched on a rock above. Reaching Galiano’s Point Dionisio called for a layover day — relaxed, land-based exploration without packing up tents, gear, and boats. And enjoy our layover, we did! 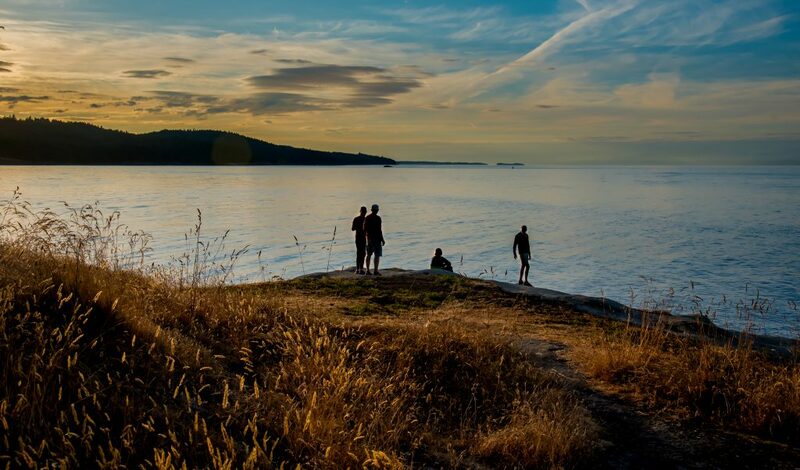 Gorgeous seascapes, abundant sea and land wildlife, a short walk to a protected First Nation village site (and their absolutely pristine beach cove), an invigorating dip in the ocean, and new memories or tall tales on the beach with awesome friends. Our awesome group for this trip: John Webb, Charles Ferris, Lisa Shapiro, Jeanette Turvill, and the nose of my boat! 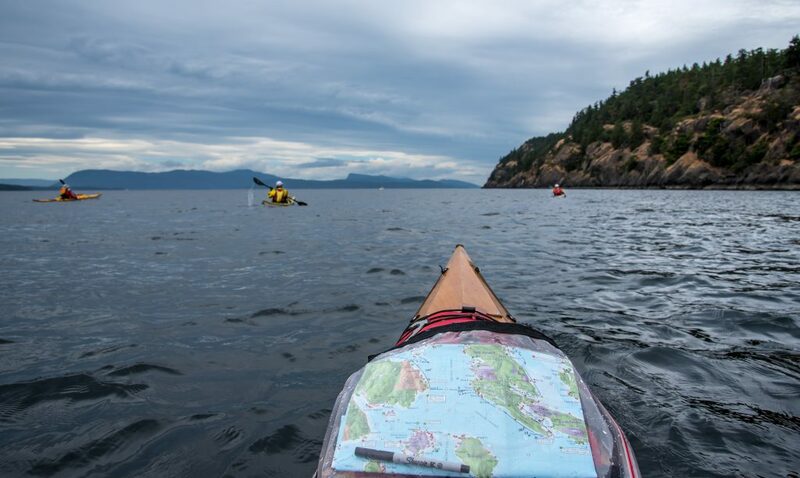 Friday morning we awoke with purpose; we needed to pack and be OTW (On The Water) by 8 a.m. so as to paddle out of Porlier Pass before the turbulence of ebb tide, and paddle 17 miles south along Galiano Island’s west coast. By day five now, that was no problem. We easily even took time to look for a stranded baby seal, injured and stuck in a rock crevasse, discovered at low tide the day before. 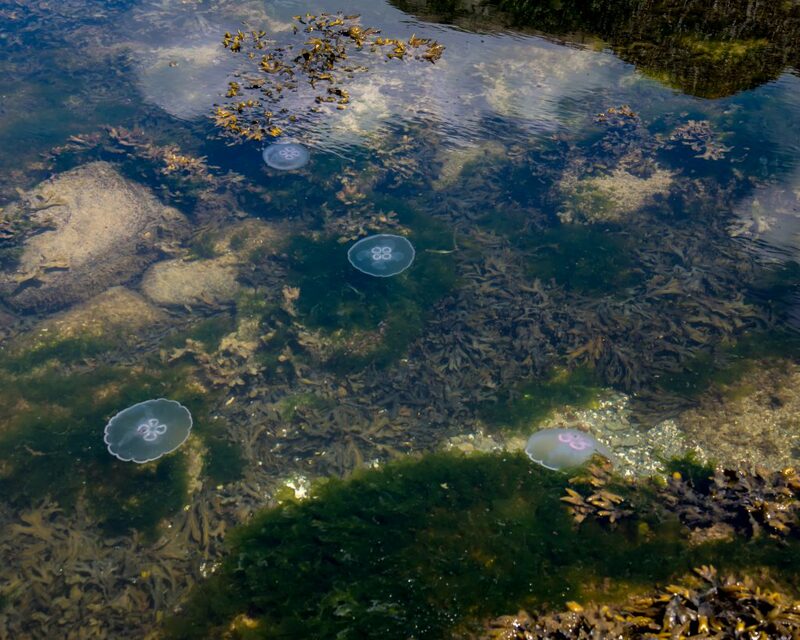 At high tide now though, s/he was gone and we all anthropomorphically hoped for the best. Although nature is beautiful, it is we who are sentimental. Rounding the point from Porlier Pass, we again hitched our planned tide ride south along a beautiful morning coastline of clear blue water accented by flowing kelp and steep shading cliffs above. Reaching Montague Harbor, we were slightly tempted to lunch at the restaurant, but limited ourselves to an ice cream and replenishing our drinking water for one last night, 4 miles and a short crossing away, on Prevost Island. By this our sixth night out, crossings among ferries, dangerous tide races, and miscellaneous unknowns seemed all the norm, well within our experience and capabilities. It had been such a fun week! After setting up our last night’s camp in the abandoned apple orchard on the beach above James Bay, we settled into one last long evening of island happy hour. In 24 hours and one more paddle day, we would savor an actual shower, and our traditional celebratory pub burger and brew. This is Ben’s fourth Northwest kayaking expedition in his Pygmy Murrelet 4pd, which he proudly built in 2012. He had previously built a Pygmy Osprey Triple, which he still enjoys, especially with family.